Any observant follower of the PC gaming market will have noticed the trend towards equipping peripherals with RGB lighting. The convergence of many gaming products in terms of performance means the extra customisability provided by RGB lighting makes for an interesting differentiator. 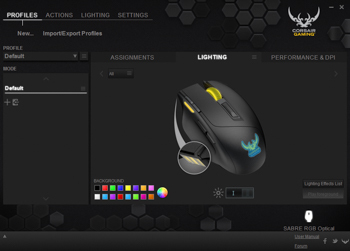 Corsair has been a leading light for RGB innovation. Back at CES 2014 the company revealed its prototype Vengeance K70 RGB keyboard, which finally made it to retail in September 2014. The pioneering use of Cherry MX RGB switches represented the first time a mechanical switch had a baked-in LED. Such an implementation allowed Corsair to circumvent previous reliability issues of LED keyboards by shielding the LED from ESD inside the switch, rather than exposing it on the main PCB. Since the Vengeance K70 RGB Corsair has successfully rolled out RGB across many gaming keyboards but also across gaming mice. Today we are examining the Corsair Gaming Sabre Optical RGB mouse which, if you hadn't already guessed, promises extensive RGB customisation as its unique selling point. 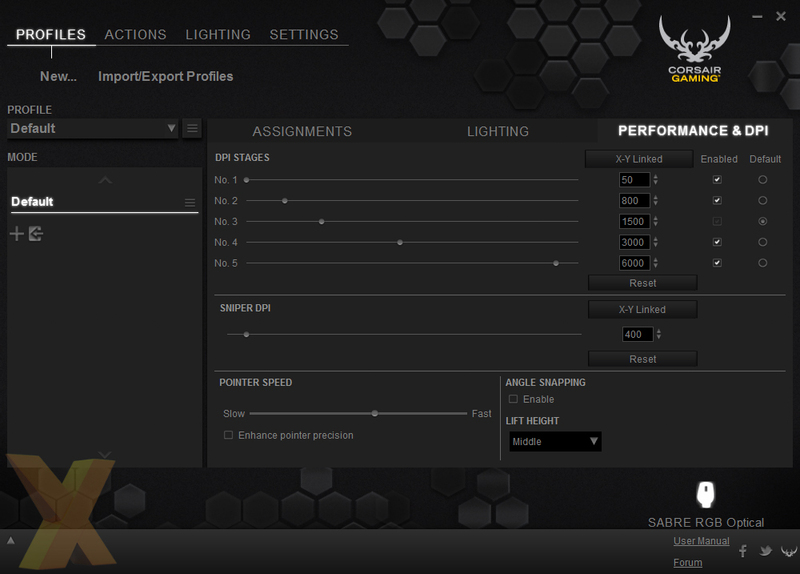 Importantly, there's a lot more to the Sabre Optical RGB than just lighting effects. 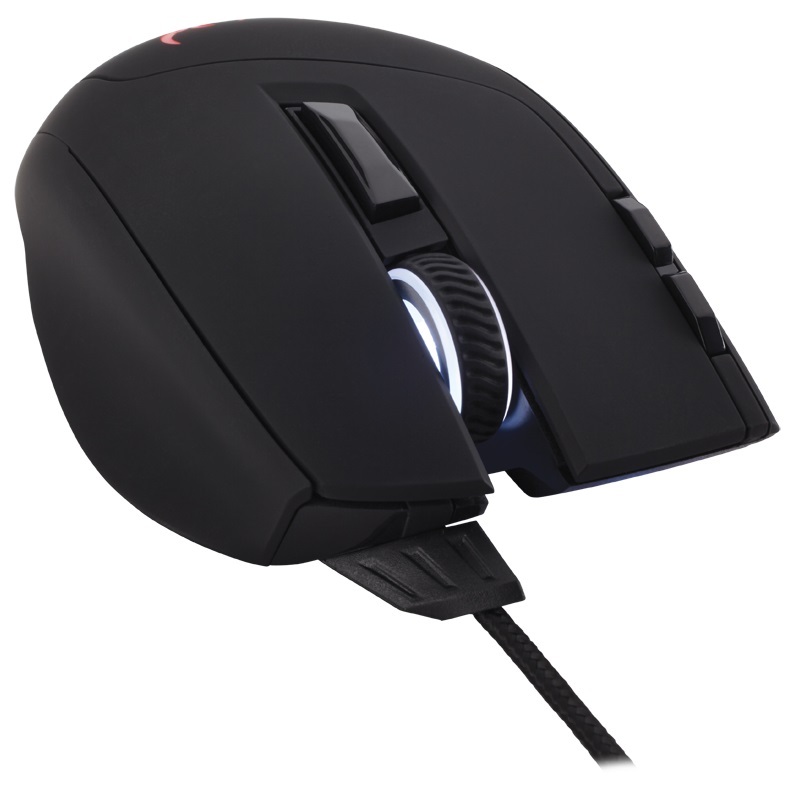 At its core the mouse is built from the top-flight Pixart (Avago) ADNS S3988 optical sensor providing up to 6,400 DPI. 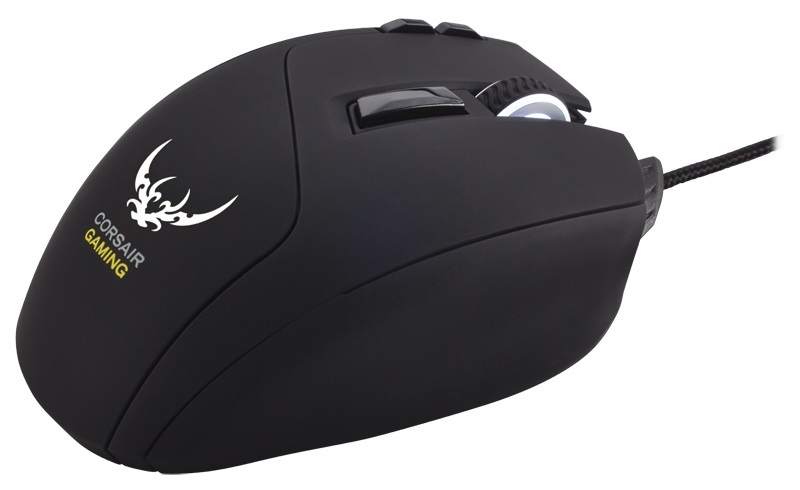 The ergonomics of the Sabre Optical RGB mouse are tailored towards right-handed users and suit both claw- and palm-style grips, depending on hand size. Users with a small-to-medium hand size will find a palm or hybrid-palm grip (using the thumb, index and middle finger in palm with the ring and pinky fingers in claw) work best. Large-handed gamers will need to make use of a fully-fledged claw grip. 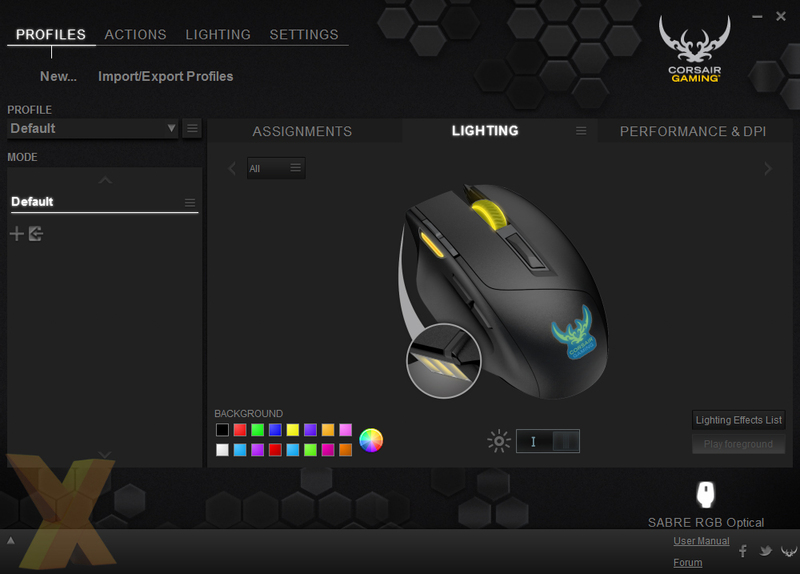 Corsair finishes the Sabre Optical RGB with soft-touch rubber that lacks breathability but provides comfort. A notable strong point of the Sabre Optical is the high-quality buttons that provide satisfying tactile feedback but can still be actuated without excessive force. The RGB lighting is provided in a 4-zone implementation. Zones one, two and three are all visible on the top of the mouse while the fourth zone is situated on the underside to provide a pleasant glow on the mouse surface when in a dimly-lit environment. All four LEDs are fully customisable to the user with 16.8-million permutations (256 x 256 x 256) of red, green and blue. 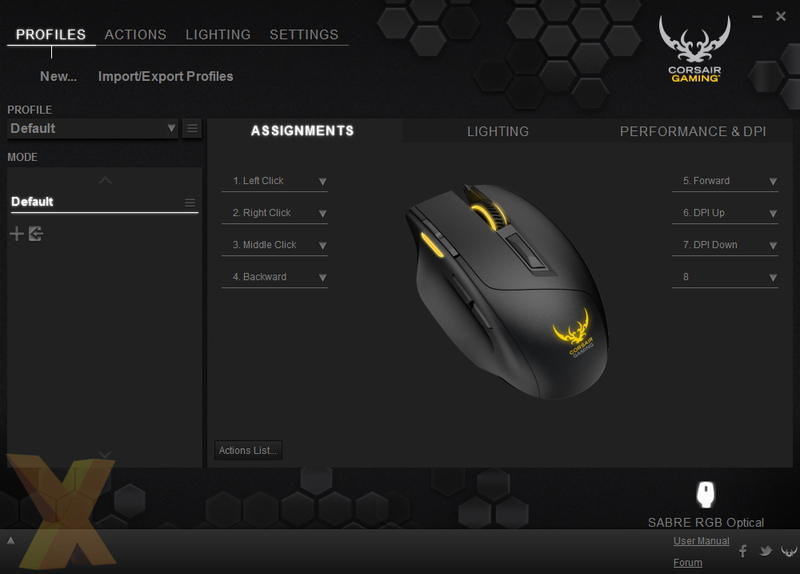 Corsair's CUE software will unquestionably overwhelm most users for a mixture of good and bad reasons. Positively, the software offers an incredible number of customisation options such DPI adjustments, with increments as small as one and X-Y (de-)linkage, different lift-off heights, an advanced macro-editor and a mind-boggling number of different LED effects. 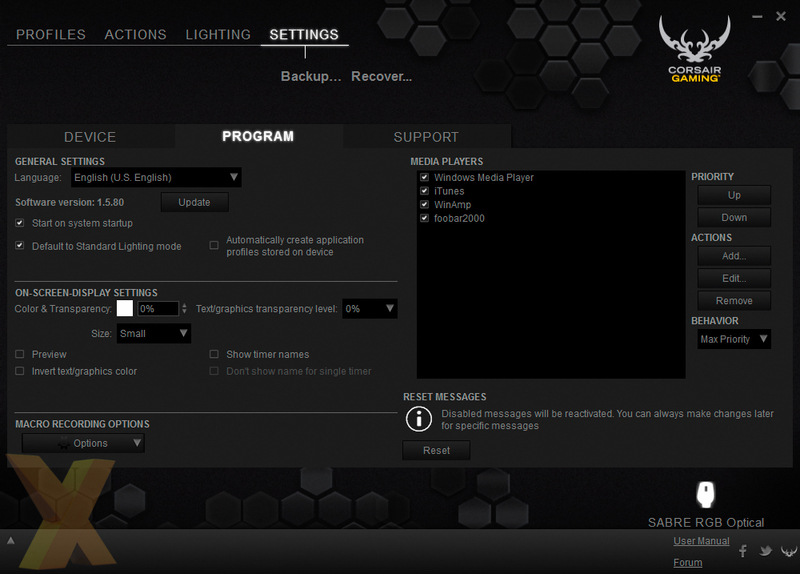 In this regard Corsair's software is easily among the most potent on the market. However, there are two sides to the story and the second side isn't optimal. Anyone with experience in the fields of human computer interaction (HCI), usability and user experience (UXP) will appreciate just how important aesthetics, layout and a consistent user interface are to good software. 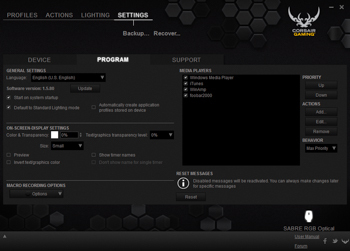 Corsair's CUE software is poorly laid-out, visually cluttered and generally inconsistent, culminating in a frustrating experience. The user manual, for reference, is a staggering 147 pages long while the quick start guide weighs in at 13 pages long. The primary issue is the excessive number of tabs, nested tabs, pop-up windows and boxes that have no logical or consistent layout across the different parts of the software, and these rapidly clutter the screen and disorientate the user. Furthermore, some options are hidden behind right-clicks when they should be presented all the time; the foreground lighting editor is the biggest offender in that regard. Another frustrating issue is that the function of some available options are not immediately clear to the user, who has no idea what to expect without trial and error. The software's fundamental method of organisation into four primary tabs - Profiles, Actions, Lighting and Settings is confusing. A better user experience would be delivered with intuitive tabs such as 'Button Assignments', 'Performance', 'Lighting' and 'Settings'. 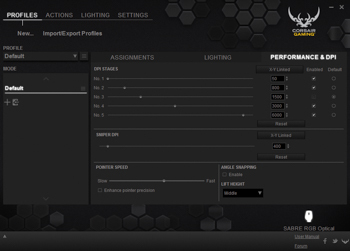 A novice user could determine, clearly, from such a layout that macros, button profiles and button (re-)assignment would be found in the Button assignment tabs while all things associated with lighting elements, such as the editor and profiles, would be found in the lighting tab, and so forth. 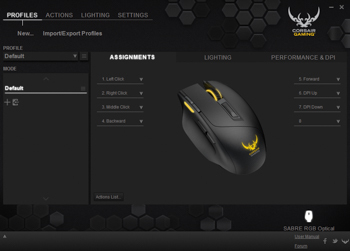 Corsair's CUE software, in our opinion, needs a ground-up redesign. 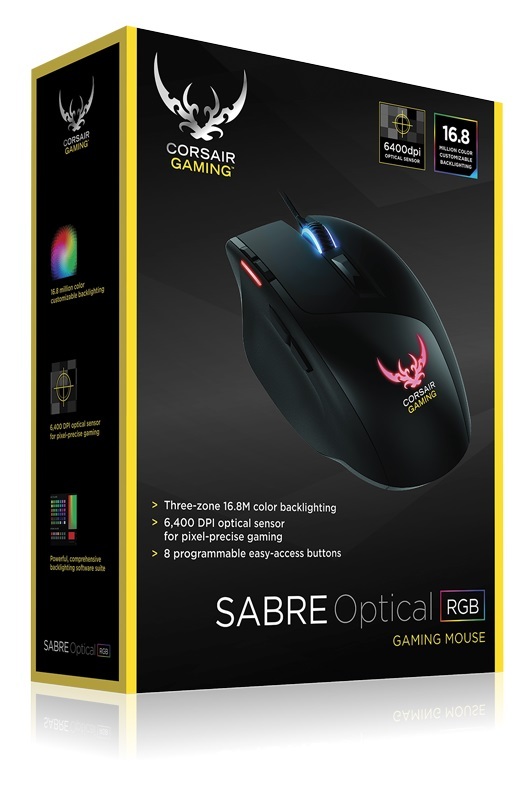 Corsair's Sabre Optical RGB mouse demonstrates that you can have a premium-grade sensor, ample functionality and a comfortable design without paying over the odds. 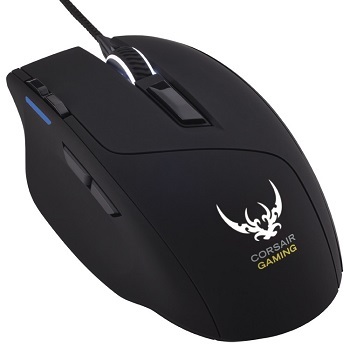 The frustration associated with Corsair's software rapidly fades away once you get the opportunity to take the mouse for a test drive. 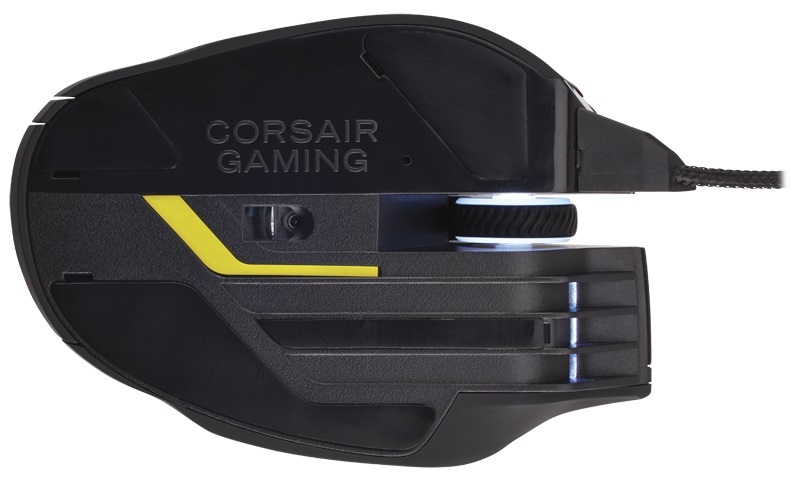 Corsair's Sabre Optical RGB gaming mouse is easy to manoeuvre thanks to the large PTFE mouse feet and lightweight design. Long gaming sessions are comfortable and produce minimal fatigue. 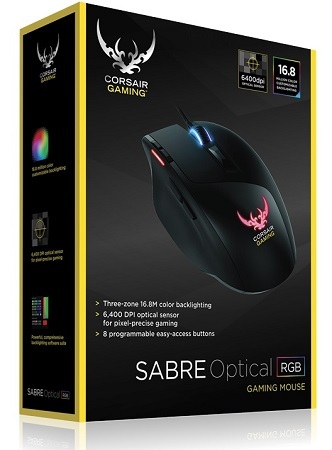 The excellent tactile feedback and accessibility of the extra mouse buttons makes the Sabre Optical RGB excellent for a variety of game genres, particularly where binding macros helps with gameplay. Having macros for melee attacks, hand grenades and enemy spotting, for example, makes the Battlefield experience significantly better. The optical sensor tracks well on hard and cloth surfaces while the wide DPI range means every type of gamer will be able to find a performance profile which suits their specific needs. 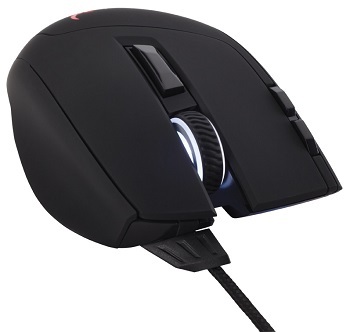 It's easy to forget while using this mouse that its price is a meagre £38 ($60) - the comfort, functionality and performance would have you thinking otherwise. In a bustling market of PC gaming peripherals it's easy to forget that you don't have to pay a premium to get a top-level product. Corsair's Sabre Optical RGB may be lauded because of its advanced RGB functionality, but the complete package on offer is certainly nothing to scoff at. Corsair's Sabre Optical RGB mouse demonstrates that you can have a premium-grade sensor, ample functionality and a comfortable design without paying over the odds. Suited for a wide range of gamers, the only blemishes on an otherwise excellent product are a lack of weight adjustment options and overly-complex software. 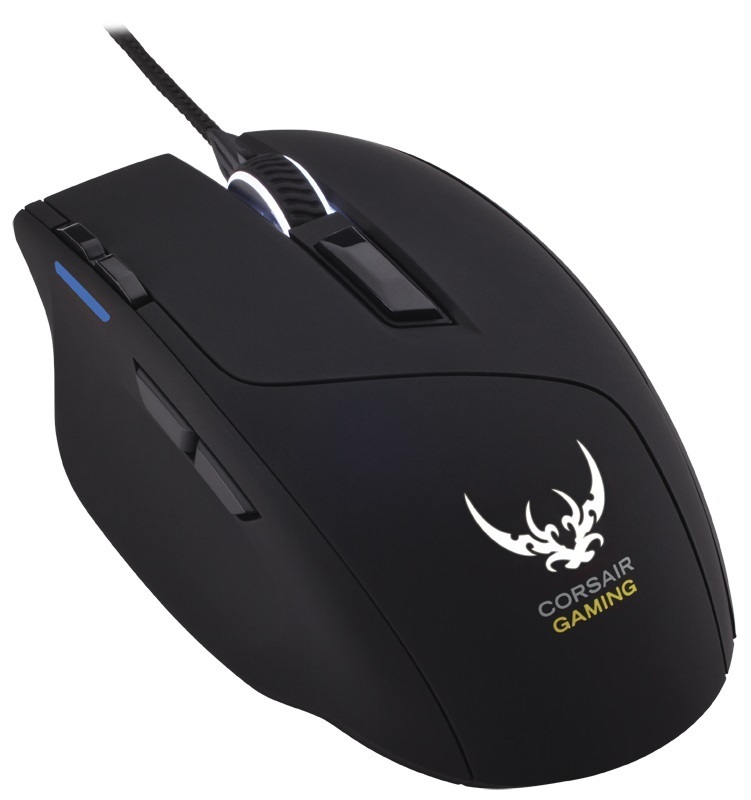 The Corsair Gaming Sabre Optical RGB mouse is available to purchase from Scan Computers*.